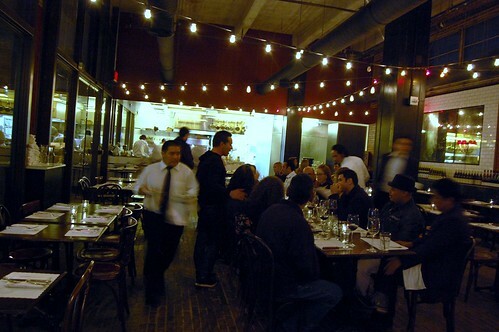 Per Mr. Diabolina's suggestion, we tried a new place in the 'hood with our fashionable pals. Diabolina already beat me to reporting on our evening. 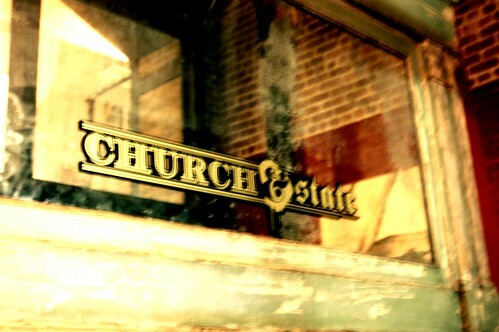 Church & State (1850 E. Industrial Street, Los Angeles) sits at the bottom of the Biscuit Company Lofts, which were once the West Coast headquarters of Nabisco. It's an interesting location for a restaurant. The area is gray and run-down, as the street name would indicate. 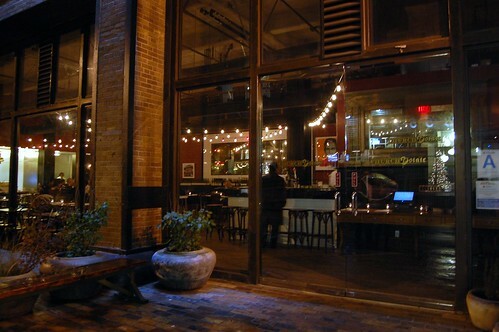 It felt a bit like the Meatpacking District in New York City in its earlier days. I can only hope this part of Downtown L.A. heads toward such dynamic development. 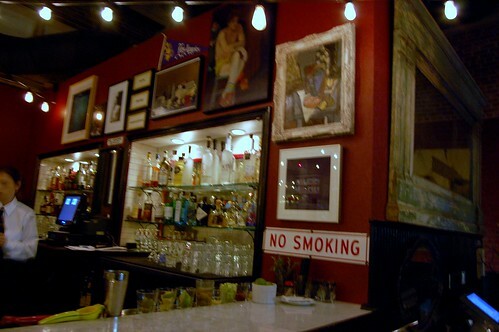 The interior is rather New York, too. Dark. Masculine. Bustling. We couldn't resist ordering the moelle de boeuf ($12). What is that? It's roasted marrow bone! It was fun exploring with fellow gastronomical adventurers. How do you eat bone marrow? You take a knife, scoop out some marrow, and spread it like butter on toasted bread. 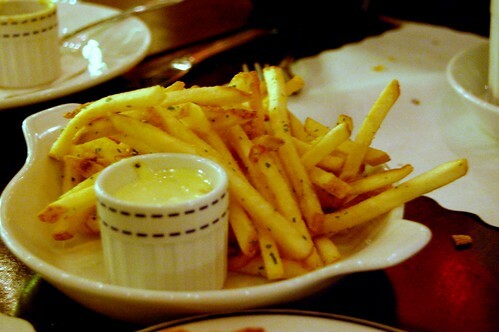 You're essentially eating beef fat. And it tastes like it. It was nice to try, but I doubt any of us will order moelle de boeuf in the future. 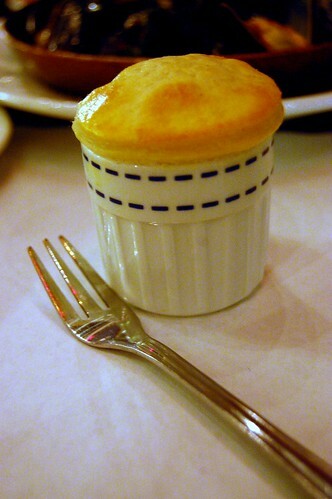 In contrast, we all enjoyed the escargot de Bourgogne ($12), which were baked in garlic and parsley butter and topped with flaky puff pastry. I liked it so much that I had two. Monkey loves snails. Nom nom nom. 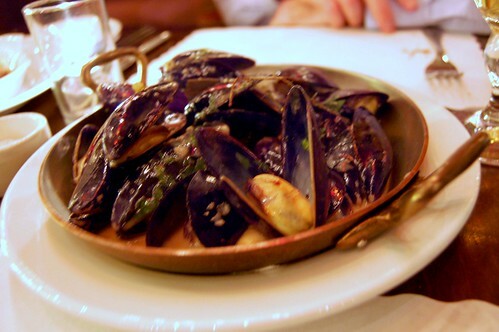 The mussels swam in white wine, and aioli accompanied the pomme frites. 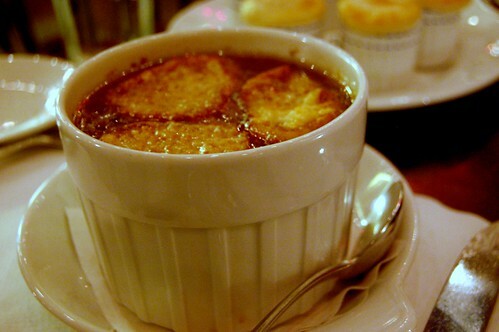 I can't say I was impressed by the soupe à l'oignon gratinee ($9). 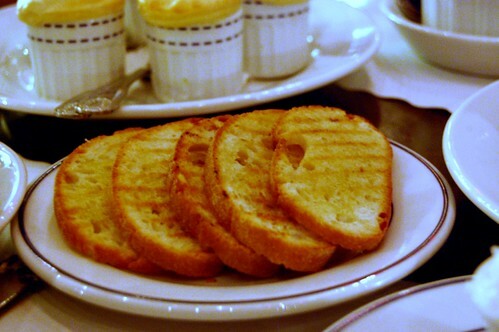 We've been spoiled by Bouchon's version. Mr. D had the loup de mere à la grenobloise ($24). 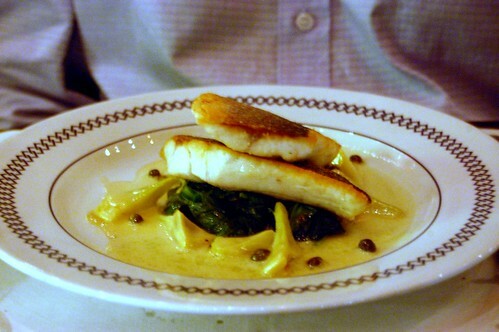 His sea bass looked beautifully grilled, surrounded by artichokes, lemon, and capers. 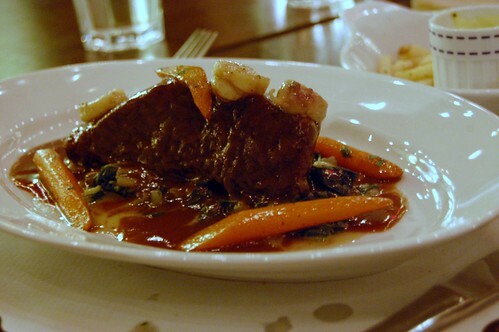 Mr. Monkey loved his beef short rib bordelaise ($26) accompanied by swiss chard and red wine sauce. So tender and rich. In my haste to capture everyone else's meals, I forgot to take a photo of my own meal! I had the dinner special of the night -- coq au vin ($19). Loved it. My chicken was juicy, great, and steeped in wine-y flavor. 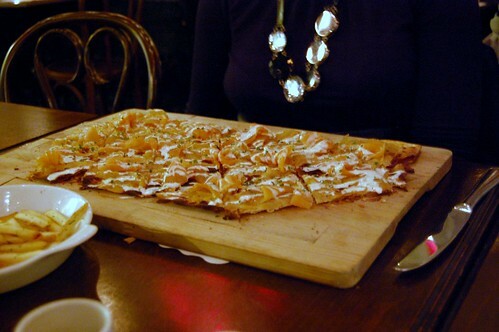 Diabolina's tarte de saumon fume ($14) was awesome. 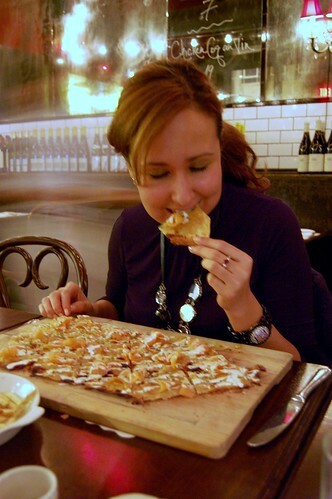 Smoked salmon, caramelized onions, and crème fraîche on thin baked flatbread? Yes, please! To make up for my lack of photo of my meal, here's a bonus pic of D chowing. Now that's a girl who knows how to dress and how to eat! 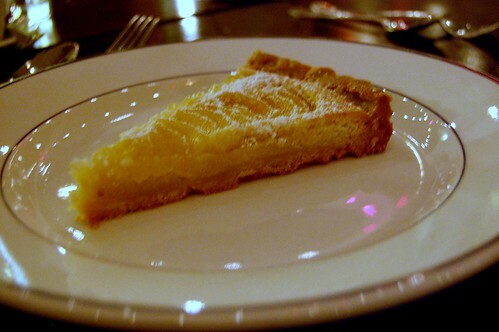 The pear tart ($7) was decent. 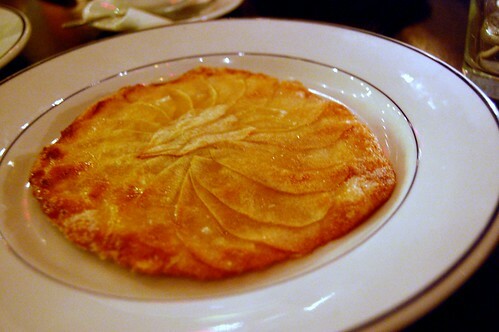 But the apple galette ($7) was something to write home about. Flaky, light, delicate, and delightful! Love! Topics of conversation during our meal included the man with tree root hands, Mr. D's run-in with an eye-less cyclops, and a bum who has feet the size of the cutting board upon which Diabolina's meal was served. Yay for a fun food-filled foray with friends and freakspeak! I have always wanted to try bone marrow. I wonder if it always tastes so-so? I have heard people rave about it! glad to see their menu offerings have expanded. i dined al fresco there for lunch the first week it opened, and all they had was salad, the soup, like 2 entrees, and a few baguettes. I'm so glad you tried bone marrow and shared so I don't have to. 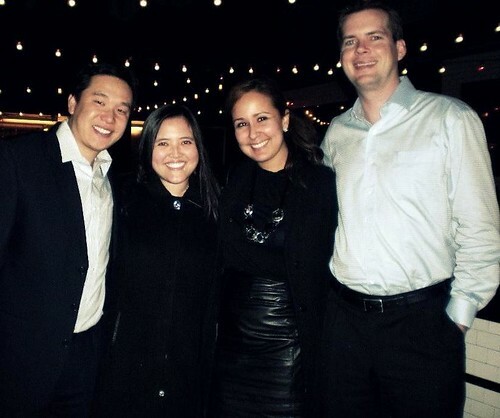 ;) Yay for great dinners with friends! Why did I click on that tree root man link? Why? 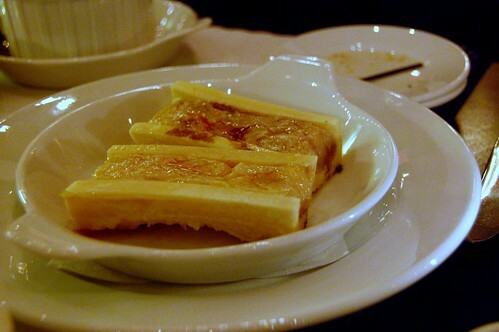 When we lived in HK, my mom used to make a beef bone marrow soup. I can't lie; it was good. ugh, why we thought freakshow conversation was good over dinner, i will never know. sorry. the food looks fabulous! what a fun evening.